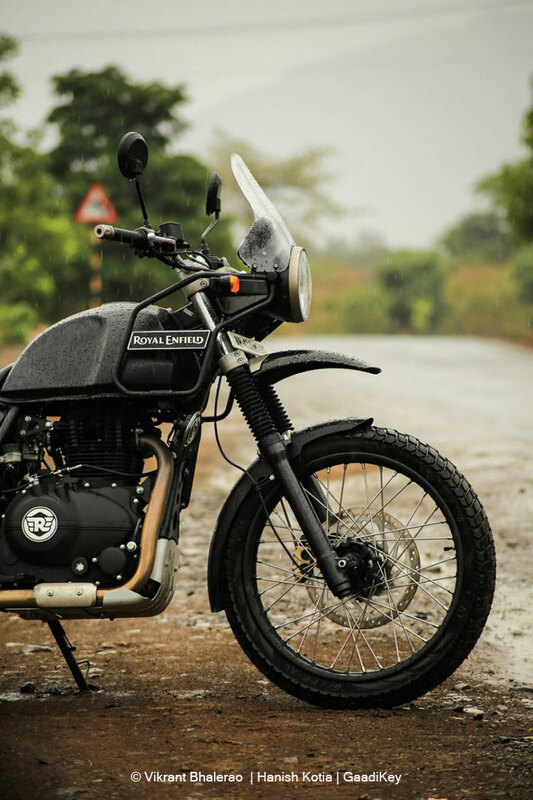 Every time when one hears the name Royal Enfield the first image that comes to our mind is that of a classic vintage looking cruiser, which by default, came with the Himalayan when company announced its launch. But as the image of the company’s one of the most ambitious project came out, it stunned the entire Auto-community. 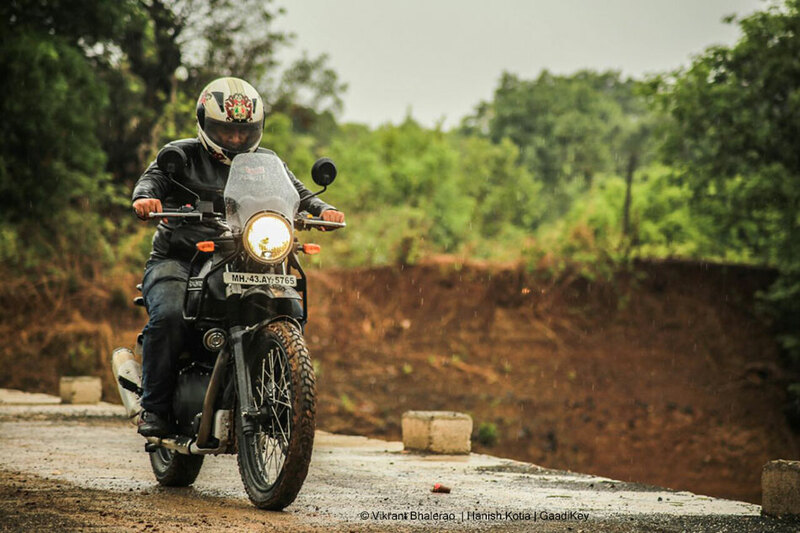 The RE gave Indian Bikers a fresh and all new bike, The Himalayan, as a perfect Adventure Sports Tourer. 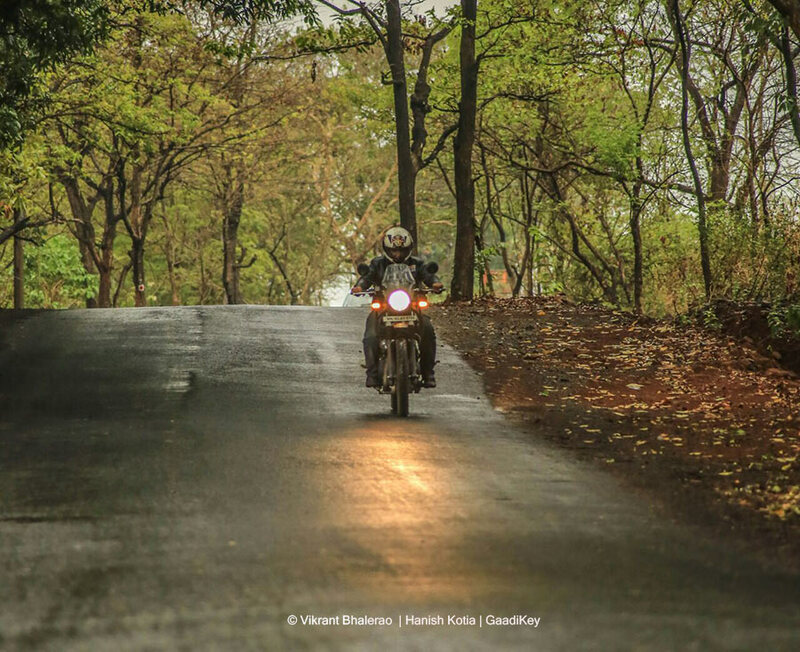 The bikes that came closest to this category were RE Thunderbird or the Bajaj AS 200 and even those did not match the Bikers expectations of Adventurous expeditions. Thanks to RE, we have a brand new motorcycle a lot of Riders who were waiting for including those who did not associate them with RE (Like me). So with all said, it was time to put my hands of this much talked about bike. 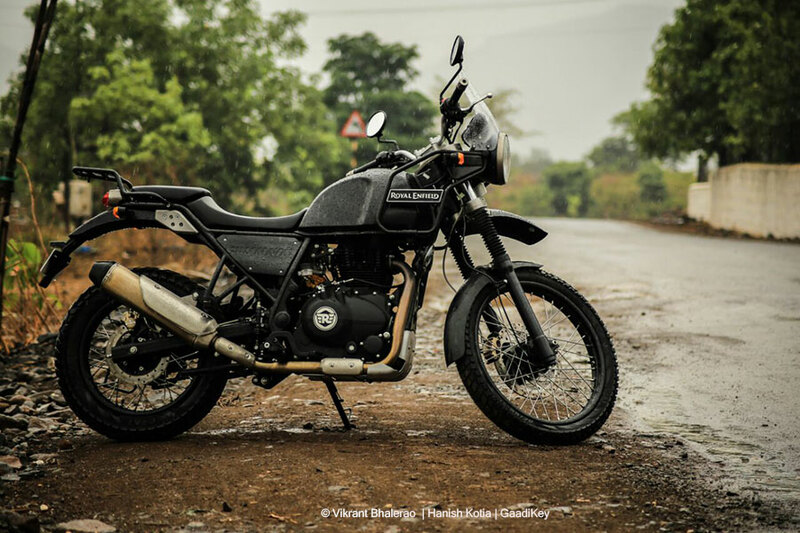 From the First look of the Himalayan, it is surely a complete fresh design from RE and undeniably it justifies the purpose it is built for. It’s Lean, tall and carries the aggressive look for its adventure touring purpose. I was personally never a big fan of RE Machines, but I loved the way Himalayan was put together. The design is completely different from everything that’s available in India. High mount headlamp, meter and console directly attached to a crossbar connecting to the main frame of the bike taking all the weight. It is semi-digital console with Speedo, RPM and Fuel gauge in classic needle while the digital analog has the Odo-meter, Gear position, Time, Temperature, Trip meter and also a Compass mount. Himalayan also comes with Caution indicators. A USB port would have been a welcome change for a riders using GPS/Maps or to charge the phone while on the go. The sad part about the crossbars connecting the chassis is the unfinished look. The welded joints are easily visible all over the frame of the bike and can become eye sore. The 16 litre oddly shaped fuel tank, with a nice matte finished bearing the Bikes name works well for a Rider top get in good riding position. 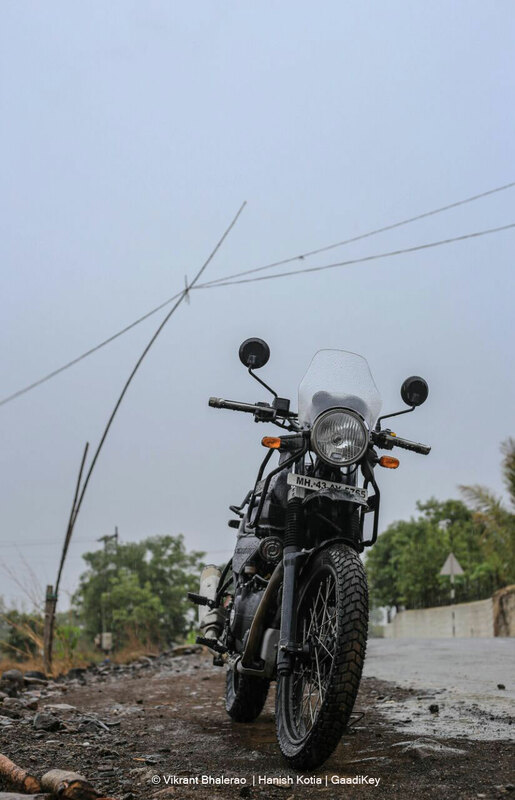 Straight handle bars, Round mirrors, round Headlamps are some of classic RE deign found on Himalayan. The exhaust on the Bike seems really good takes a high position and the finish on entire pipe looks neat. The Ride height is good but can become troublesome to short heighted riders since getting on the bike gives a stress on the lower back and becomes painful. The headlamps runs on a 12V blub while the tail gets LED Lamp. Here I feel the Bike misses a DRL since its purpose is adventure. Huge suspensions, High windscreen, high fenders, added Rack on the back for luggage and with no plastic it is all put together around all new RE LS 410 engine on a Half-Duplex Split Cradle Frame. The Engine, all new built from ground-up as claimed by RE, is a Single cylinder 411 cc, 4 stroke air-cooled SOHC, with 78mm of Bore and 86mm Stroke. Built from scratch, The LS410 where LS stands for Long Stroke, has no other fancy tech going into the Engine and runs on 9.5:1 compression ratio and simple two valve head. A small oil-cooler is attached to the engine just to keep the temperature stable under hard riding conditions. I rode Himalayan for over 350 kms in 2 days and desperately felt the need of Oil-cooled engine. The engine heats up pretty fast after an extensive ride. At constant speed the engine stays smooth with very little vibrations but as you rev hard on higher RPM’s you can feel the bike rattle a lot. Straight handle bars becomes somewhat uneasy for a long rides. With max of 24.5 bhp of power and 32 Nm of torque the bike is at its best in between 4000-5000 rpm above that the bike loses its feel. One can easily use the 32Nm of torque to pass through traffic and with its slim design it does fairly well in moving through traffic. 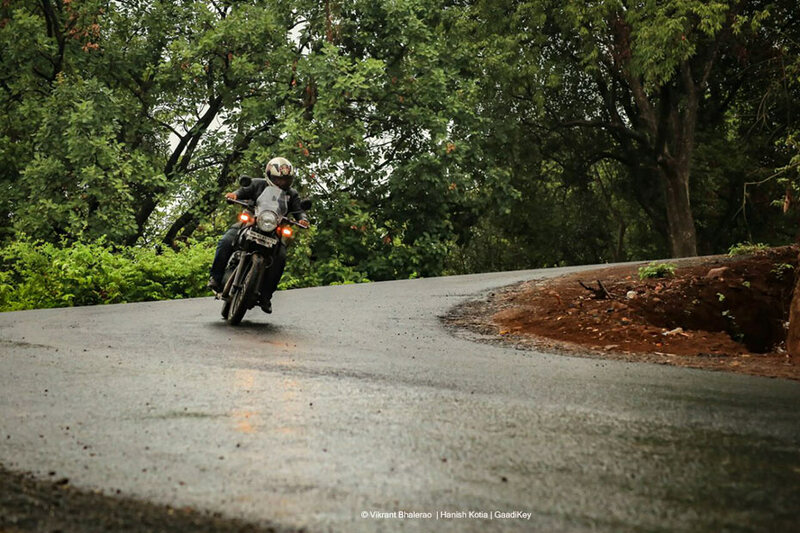 On highway, the bike is very pleasant to ride, grips well and can cruise well on high speeds too. Top speed of the bike stood at 133kph but I really didn’t like the stability at high speeds. The Gear box comes with a 5-speed transmission with wet multi plate clutch setting. The Clutch is hard and checking gears is a big worry on this engine. On a city ride, it did give a hard time on shifting gears and using clutch. Shifting from 1st and 2nd becomes very difficult and have to pull it hard. Keep the bike revved at 2-3k rpm and gears shifts amazingly well. Going on neutral is another problem the bike has. Fuel Economy was not a surprise as the bike churned out around 25kmpl inside city roads and around 34kmpl on highways with a overall of 29kpml it was a fairly decent mileage for this bike. Exhaust sounds good but I did miss the regular RE thump sound. You could hear the back compression sound when you are pushing the bike to its limits. 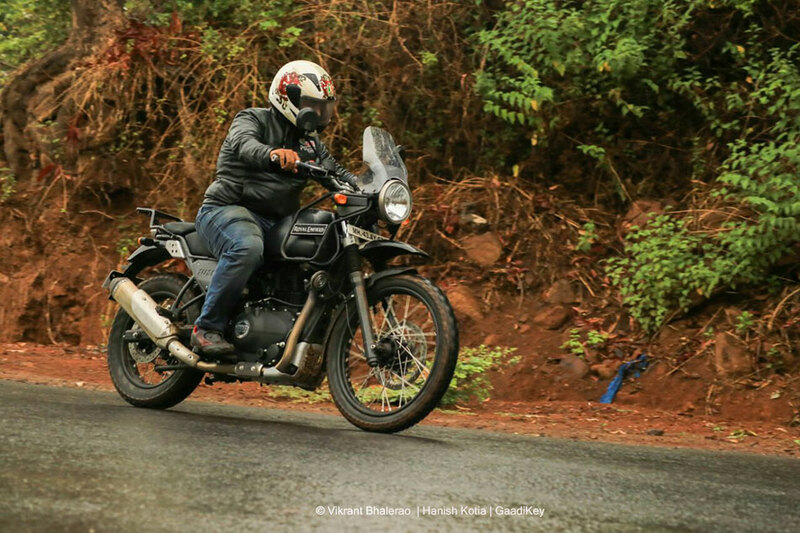 The brakes of Himalayan are good with 300mm 2-piston floating disc on front and 240mm disc on rear it was very easy to brake at high speeds without compromising on grip on rear as well as on front. I rode the bike in all possible conditions and the brakes worked just fine. Because of the straight handle bars I had to adjust my riding position so that while braking I don’t feel pressure over my elbows. Tyres worked amazingly well under all conditions even during off-road journey. Front is 21” with 90/90 size and rear is 17” 120/90. 41mm telescopic forks on front and Mono-shock linkage on the back suspensions are very responsive in all terrains. Riding on city roads was smooth and loading the bike with heavy weight back-pack too worked without any hassle. Jumped a couple of speed breakers and those suspensions and tyres didn’t tweak. It holds roads fine even in off-roading conditions. Cornering this heavy weight was fairly easy. It naturally held the line and leaned into the corner making the ride easy and confident. 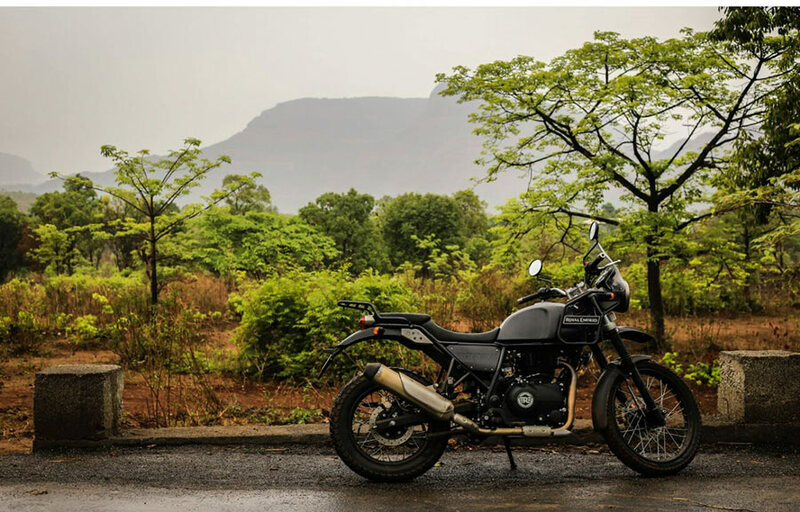 Overall Himalayan gives great ride on every conditions and has ability to make you fall in love with this machine. To Finalise, RE’s effort to bring all new motorcycle after decades and giving Indian riders a purposeful motorcycle is credible. 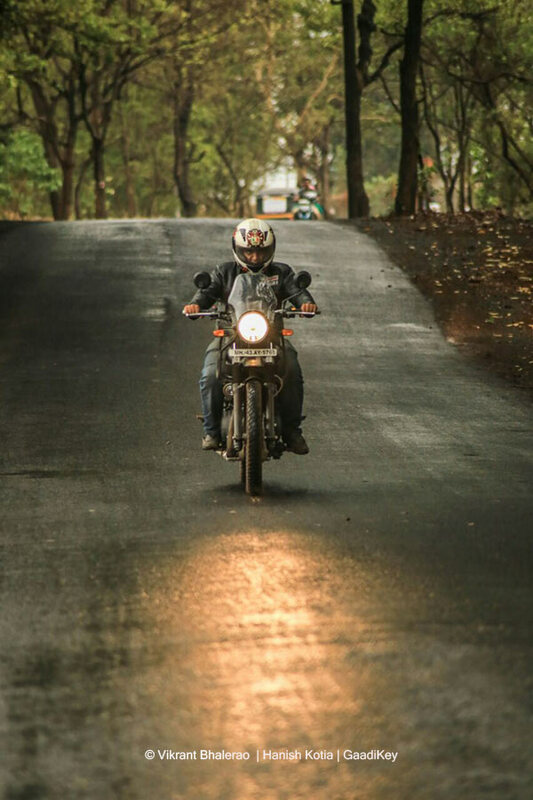 Except for little twitches and design faults, The Himalayan, is the best Royal Enfield money can buy. At Rs. 1.8 lakhs on-road in Mumbai, its best deal. Though, personally I feel not many RE users will replace their existing machine for this but surely can add this to their garage. The instrument cluster needs upgrade with Caution indicator shifting to near the riders reach, Compass can be removed for a better purpose for USB mount, higher power of maybe 5-10 bhp more, ABS since braking in wet conditions with all this weight can get tricky, a better sounding exhaust, Curved handle bars, Full oil-cooled engine are some things which I feel is missing. But overall I will do suggest riders to go for Himalayan if they are more of adventure filled journey rather than city commute. With two colour options, Black and White, White has an edge over black. 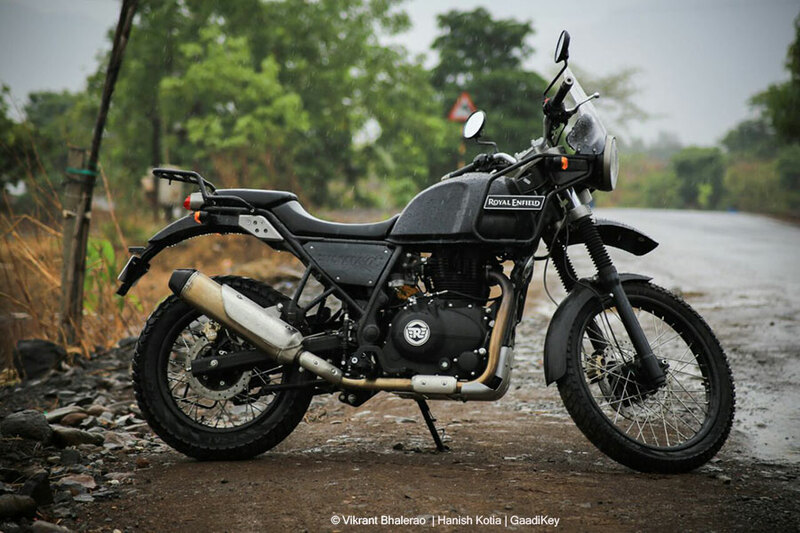 I would give the Bike overall 3/5 rating and the best bike from Royal Enfield’s portfolio. We would love to hear from you, please do leave your views in the comment box below! MBA-Motorist Biker AutoHead, Racer, Entrepreneur. You can follow me on Twitter or Instagram .